Hello fellow crafters! This card was made for a friend who I've never met in person. When I was working I had telephone contact on a business level with this person (who lives out of state) quite often and over time we became telephone friends. After retiring we continued to keep in touch via phone calls and birthday cards. I began my project with first creating my base card in GKD Pure Luxury White card stock. This was put aside and I worked on my front panel. A piece of PTI Spring Rain card stock was cut slightly smaller than my base card with a die from Sue Wilsons Double Pierced Rectangles. 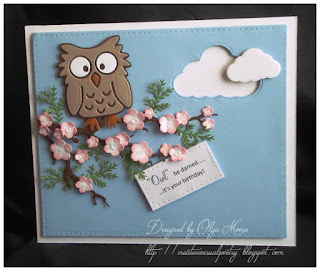 Using a die from Poppy Stamps Fancy Clouds, a cloud was cut out to leave a negative space. Another smaller cloud was cut from the same die set and adhered slightly over the negative space. Next, a tree branch was created using a die from Spellbinders Cherry Blossom set in PTI Dark Chocolate card stock. Another duplicate branch was cut but partially snipped off and the two branches were attached at one end. Using the flower dies from the Spellbinders Cherry Blossom set, several flowers were cut in various sizes in white card stock and then the edges sponged with GKD Innocent Pink ink. The centers were filled with Nuvo Crystal Drops. Also, Wink of Stella was applied to the tips of the flower petals. The flowers were put aside to allow the crystal drops to dry. In the meantime, the owl parts were cut using Elizabeth Craft Poppy the Owl die and assembled using PTI Dark Chocolate, Kraft and GKD Pumpkin Spice card stock. Next, the tree branches were adhered to the blue focal panel using dimensionals. The flowers, the centers now dry with the crystal drops, were randomly adhered to the tree branches. Fern leaves from MS Fern punch were also added to give fullness to the flowering branches. The owl was then attached using dimensionals. The sentiment was computer generated on white card stock which had been cut with a Cottage Cutz Pierced Rectangle die, and popped on under the tree branch with dimensionals. My focal panel was then attached to the base card with dimensionals and my project was complete. This was a fun project to work on. I hope my telephone friend will enjoy this card as much as I enjoyed making it. Thanks for visiting my blog. Hope you come back again soon. This is so adorable!! The owl is too cute!! I love the flowery branch he's perched on!! What a fabulous card!! Thanks so much for playing along at Scrapy Land!! A super wonderful card design and I am sure your friend will love it too.